A WC19 crash-test approved occupied transit option is now available on the Q6 Edge® HD Power Chair with Synergy® seating. 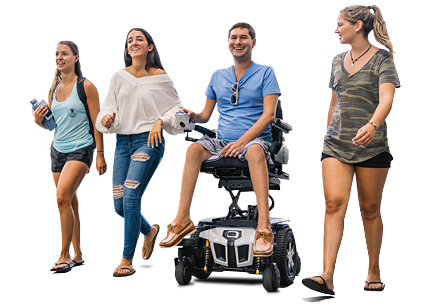 With standard features like 4-pole motors, Mid-Wheel® 6 Design, ATX Suspension, and optional iLevel® power adjustable seat height, the Q6 Edge HD is engineered to meet the performance needs of the most active user. Featuring a weight capacity of 450 pounds (400 pounds with iLevel), the Q6 Edge HD accepts a complete range of seating and electronics options to deliver exceptional rehab capability at an excellent value.